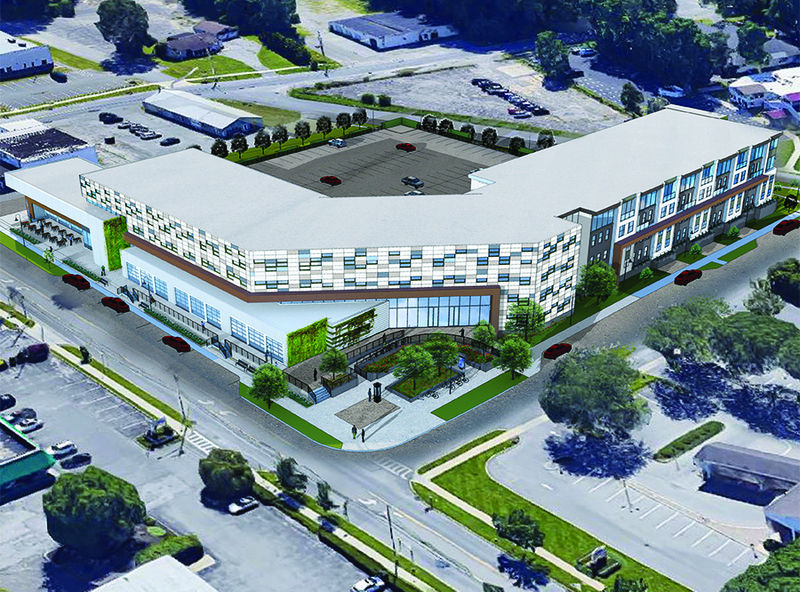 This is a rendering of the building to be constructed in what is being called SoBro, on South Broadway at the site of the former Saratoga Diner. EDI² Saratoga will be a tenant. The Saratoga Economic Development Corporation announced in June a major new initiative it said will empower world-leading integrated circuit and electronic system design in Saratoga County and New York’s Capital Region. The Electronic Design and Innovation Initiative (EDI² Saratoga) founding partners feature a cross-section of international, national, regional, and local leaders including SEDC, the U.S. Small Business Administration, Clarkson University, National Grid, Siemens, Center for Economic Growth, New York State Electric & Gas, SUNY Adirondack and locally based ReWire Energy. SEDC President Dennis Brobston estimated that the initiative will create over 100 jobs over the next five years. Brobston said that, in order to fully leverage the successes of the last 40 years in the region, the semi-conductor industry must focus on developing cutting-edge integrated circuit design to keep up with the rapid pace of the chip manufacturing industry. “We worked for more than a year with some of the top technology minds in Tech Valley and Silicon Valley to develop EDI² Saratoga and recruit a robust mix of founding partners. We are confident this model and our expanding partners will cement our region as a global leader in advanced electronics systems. Fostering front end design and workforce skills to boost applied next generation technologies will drive most sectors of economic growth and high paying wage opportunities,” he said. Brobston said there are four key elements driving the growth of the semi-conductor industry: research and development, design, manufacturing and packaging implementation. As integrated chip circuity continues to become smaller and more sophisticated, the design component is the only one of those components that has lagged behind. EDI² Saratoga will be housed in a building being constructed in what is being called SoBro, on South Broadway at the site of the former Saratoga Diner. Richard Goldman, an industry expert and native of the Capital Region, said the industry is facing “unprecedented challenges” as circuitry becomes smaller and increasingly sophisticated. By creating an environment that provides the tools, technology and the workforce to further develop the design component, the region will remain on track to rival Silicon Valley and other key hubs. Brobston said the business acceleration initiative, the first of its kind in the nation, will cement the upstate region’s place as a leader in the industry, and it will generate significant job growth and attract more businesses investment in the area. One of the key elements of the program will be its ability to provide access to otherwise cost-prohibitive electronic design automation (EDA) tools at a much lower cost. Brobston said one of the challenges in the design phase is the cost of the software, which can cost up to $3 million for a two-year licensing fee, making it difficult if not impossible for small and mid-sized companies to compete. In addition to state and federal funding, the SEDC and its partners will continue to aggressively develop new relationships with other partners, both nationally and internationally. The program will formally launch January 2109, with the accelerator work center scheduled to open in April 2019. • Expanding the number of engineers with design experience, and increasing the number of students pursuing electrical engineering degrees. • Providing innovators affordable access to powerful design software. • Establishing academic, public and private sector partnerships to support technical and capital access for translating research and development to commercialization. • Sparking workforce readiness through the education pipeline to produce and utilize these applied technologies. The primary industry engagement platform, the accelerator will provide access to EDA tools on a sliding scale basis to customers, plus offer wraparound business support services from Spark Saratoga. This unique programming will help attract talented customers to not just design new products, but also support their identifying pathways to bring new products to market. Partners will be able to engage as entrepreneurs for no or a low cost in exchange for shared equity, as a standard customer for a monthly rate, or as an investor for an annual fee. Standard customers will receive access to the tools and support services on a monthly basis, entrepreneurs will receive the same, but with additional mentoring and commercialization guidance, and investors will get full access to the software tools, as well as early reviews of new product development. With Clarkson University as a founder, and including RPI, among other academic leaders, this initiative will serve a key conduit between industry and academia to build design-centric academic programs. These activities will likely include robust curriculum development, new industry engagements, ongoing design events and showcases, and access to leading edge tools and software. Specific areas of industry focus will include advanced electronics, smart grid/building automation technology, unmanned systems, and defense applications. With SUNY Adirondack as a key academic partner, this initiative will focus on building partnerships with and among K-14 educators to drive attention and enrollment in STEM programs, increasing the talent pipeline for key technology employers. SUNY Adirondack will also lead the development of new transitional programs to guide adult and returning students into engineering, design, and technology career paths. SEDC said that in total, the growth initiative will include an investment of nearly $10 million to support tool acquisition, hard assets, business service support, industry outreach and coordination, academic program development, research, and commercialization. SEDC and its partners plan to seek funding from the upcoming New York State Round 8 of Regional Economic Development Council incentives, as well as from federal and private investment.